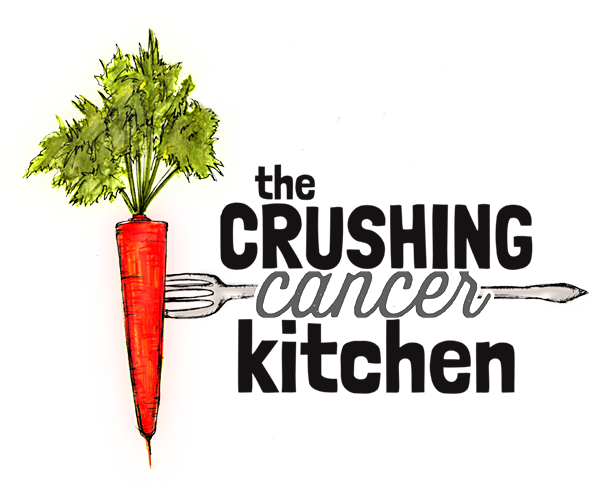 I listened to a podcast recently, a recording of a Lucky Peach event called ‘Eating Out Loud’. Just like the magazine, it was creative, hysterically funny, artistic, irreverent and at times, totally bizarre. Different people spoke/sang/told stories, including Chef David Chang, one of the founders of the magazine (and of Momofuku Restaurant Group and other awesome foodie things). I love him. I loved watching him on Mind of a Chef, I love his passionate but self-deprecating articles in Lucky Peach, I’m totally a fan. Which is why in this podcast, when he referred to paella as ‘the most overrated food in the history of the world’ I had to do the 15 second rewind to make sure I had heard him correctly. It’s not like I share his food philosophy in general, but this still surprised me. Paella?! 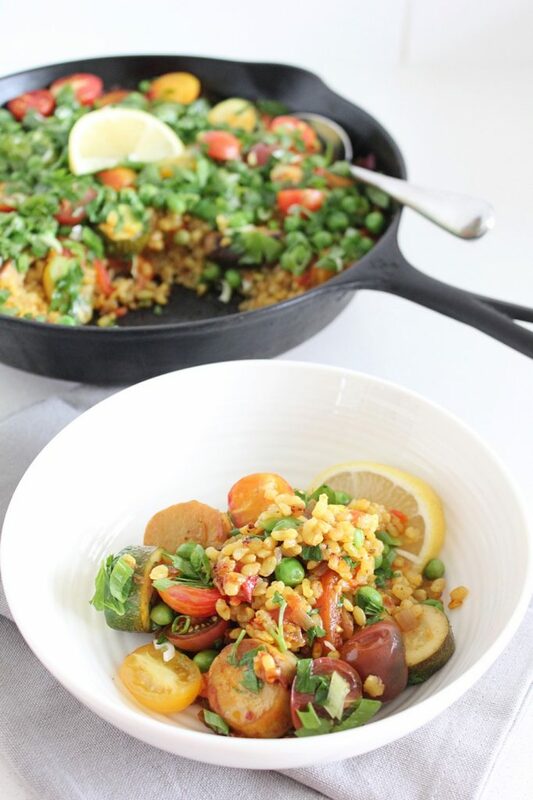 Paella is easy but interesting, electric but still sort of peasant food. 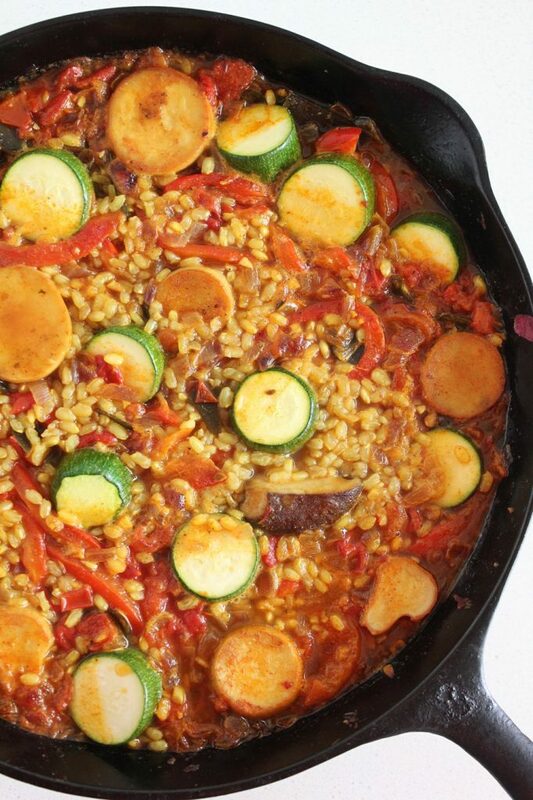 If you’ve ever spent time in Spain, you’re probably familiar with the giant, flat paella pans simmering away at the entrance to the restaurants, with enough paella for the entire restaurant’s guests plus staff, while the saffron-rich aroma wafts through the narrow streets. It tastes like dinner at midnight, stern-faced flamenco dancers and the heady aroma of orange blossoms brought to life by the still intense evening heat. 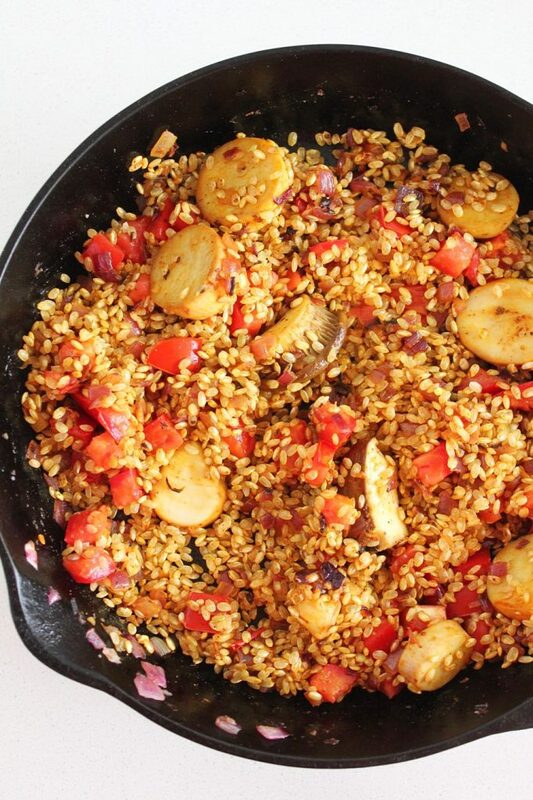 Paella is all of the good things. Thanks to David Chang, I haven’t stopped thinking about Paella for a good 3 weeks. I’ve let go of the fact that he’s not into it (like all good art, a divided audience is a good sign) and focused on how to keep the essence of this dish alive while giving it some cancer-crushing muscle for you guys. 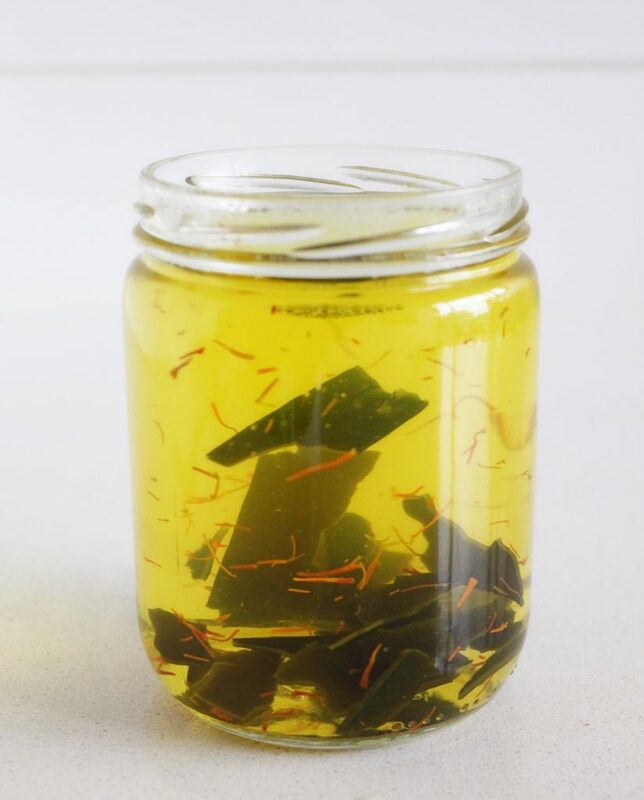 The first thing we did was make our own stock, which is more of a tea, out of kombu and saffron. This gives it lots of minerals as well as an undertone of umami and sea flavour that would traditionally have come from chicken stock, shellfish and other seafood. We added dulse seaweed into the aromatics for the same reason. 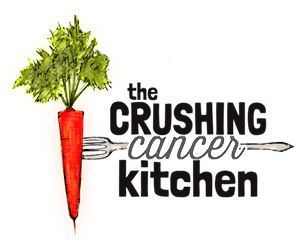 The saffron is really important to give this dish an authentic taste but is also a potent anti-inflammatory. It is expensive but a little bit goes a long way (check Costco, they sometimes carry it at an affordable price). We also use it in this deeply worthwhile recipe, in case you’re afraid you’ll never use it again. The smoked paprika is something that we use sparingly, but in this case it gives the illusion of the rich flavour that big hunks of chorizo would traditionally add. And the turmeric, once we’ve added the smoked paprika, tends to slide in under the radar flavour-wise, while still adding its anti-inflammatory powers. 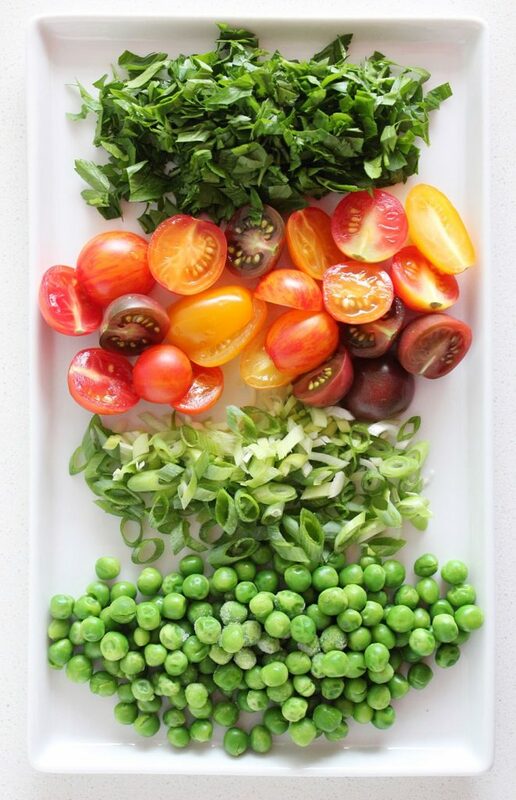 Then there are the veggies. Onions and garlic are necessary for flavour, and the tomato and roasted pepper are also traditional, but you could add artichoke hearts, fennel slices, cauliflower florets, rounds of leek, really anything that you feel like or have on hand in place of the zucchini and king oyster mushrooms (that we chose because once sliced up, they sort of look like scallops). We stuck with rice as the grain, but went with short grain brown rice (instead of white) and soaked it overnight to make it easier to digest. The amount of liquid used in the recipe will change if you don’t soak it, or if you use a different type of rice. 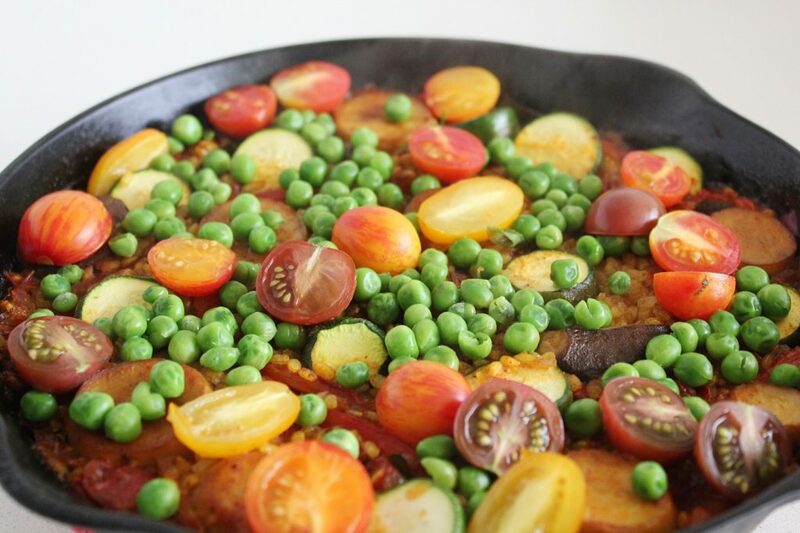 This paella isn’t traditional for most of the reasons above, but there are still flamenco stomps in there, and the veggies make it far more exciting if you ask me. 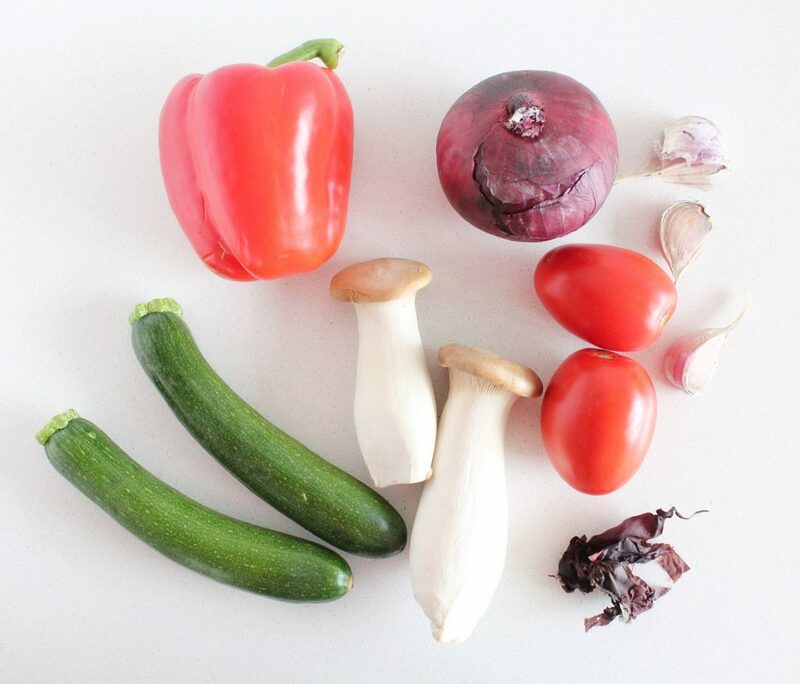 It will make your kitchen smell like Spain (and 10 o’clock bedtimes instead of 4am, and water and vitamins instead of red wine can’t change that). 2 King Oyster Mushrooms (or ½ c Oyster mushrooms, Shitakes or other mushrooms), sliced into ½ inch rounds. Add the kombu pieces and saffron. Let steep for 20 minutes or so. Don't strain it, leave the kombu in to impart more flavour and minerals into the rice (you can eat the pieces or leave them). Roast for 15-20 minutes on a baking sheet, turning on all sides for even roasting. put in a bowl with a plate on top to let steam. Once cool enough to touch, pull off skin, remove seeds and cut up into strips. 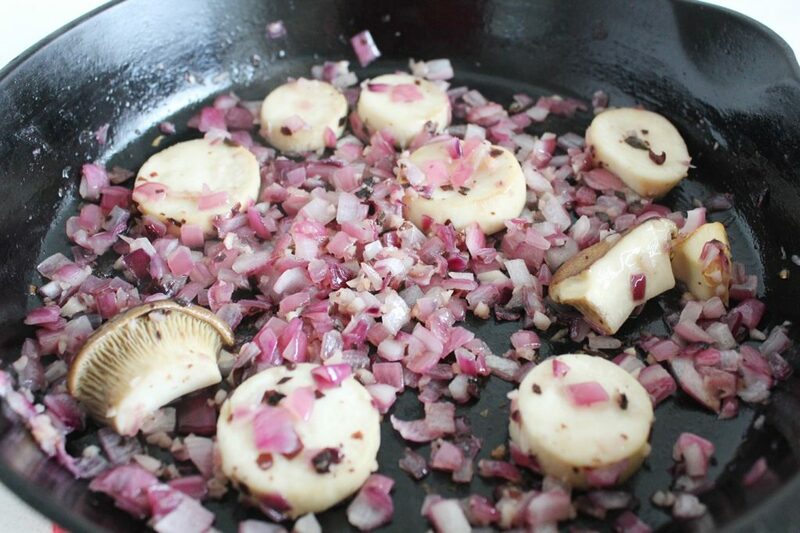 in a 10 inch cast iron pan, frying pan (or steel paella pan, if you have one), on med/low heat, sauté the onion, mushrooms and garlic in the coconut oil until the onions become translucent. Add the turmeric, paprika and dulse, sauté for another minute or so. 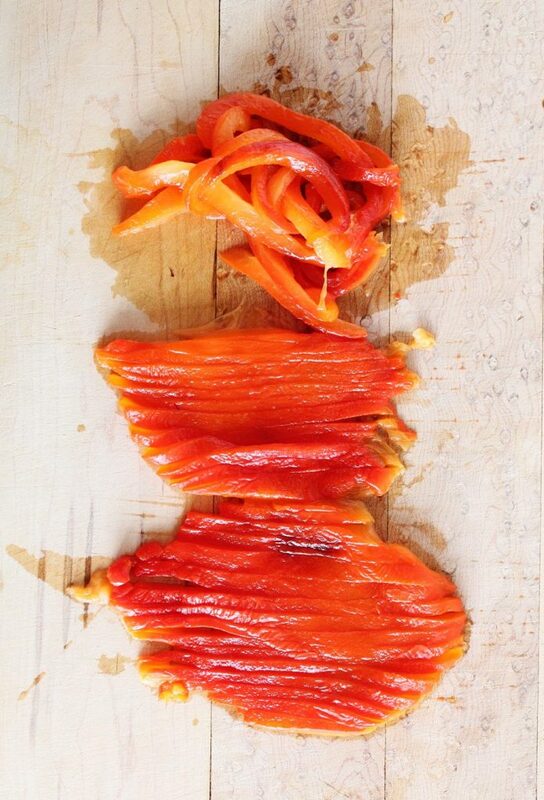 Add the cider vinegar, tomato, roasted pepper, rice, salt and pepper and stir to mix it around evenly. Cover with the stock and stir to distribute everything evenly. Bring stock to a boil and lower to a mellow simmer. Without stirring ever again, let it slowly simmer until the liquid drops to the level of the rice (about 30-35 minutes) and then wedge the zucchini pieces into the rice and sprinkle the peas and tomatoes over top. Lightly cover with foil (not touching the rice) or a loose fitting lid. 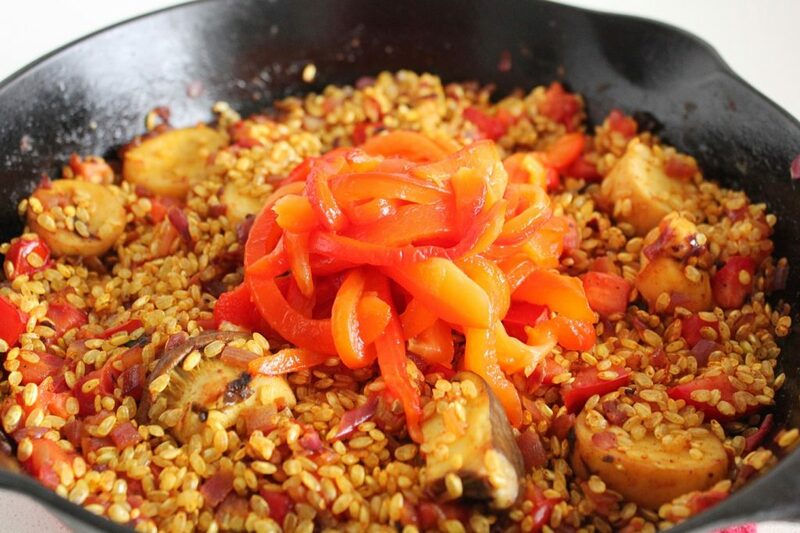 Traditional paella has a crust on the bottom where the water evaporates and fries the rice on the rice. You can do this by cooking it a bit longer than just the water evaporate stage, careful not to burn it. 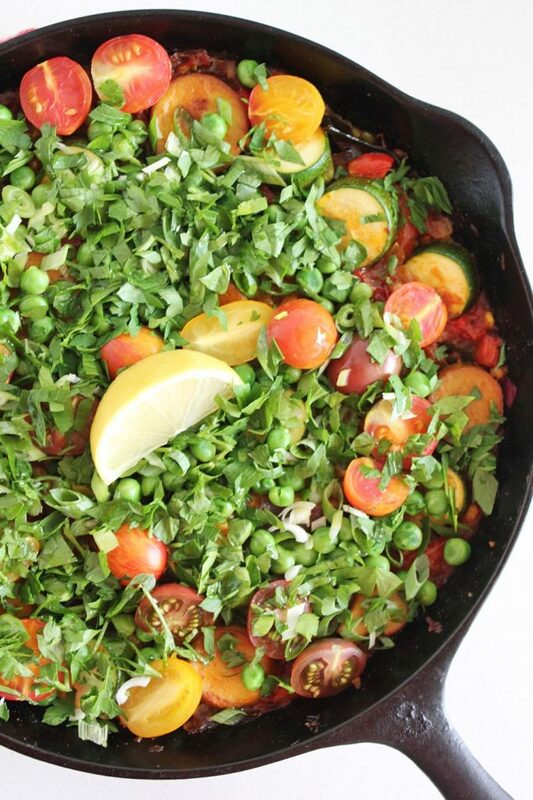 Sprinkle finished paella with fresh parsley and a squeeze of lemon and serve.